Morfa Nefyn is a large beach on the north of the Lleyn peninsula facing northwards. It is neighboured by Porth Dinllaen to the west and Porth Nefyn to the east. It is a predominantly sandy beach with a pebbly foreshore. The area is designated as the Porth Dinllaen I Borth Pistyll Site of Special Scientific Interest and the Sea cliffs of Lleyn Special Area of Conservation, with the Lleyn Peninsula and the Sarnau Special Area of Conservation to the west. 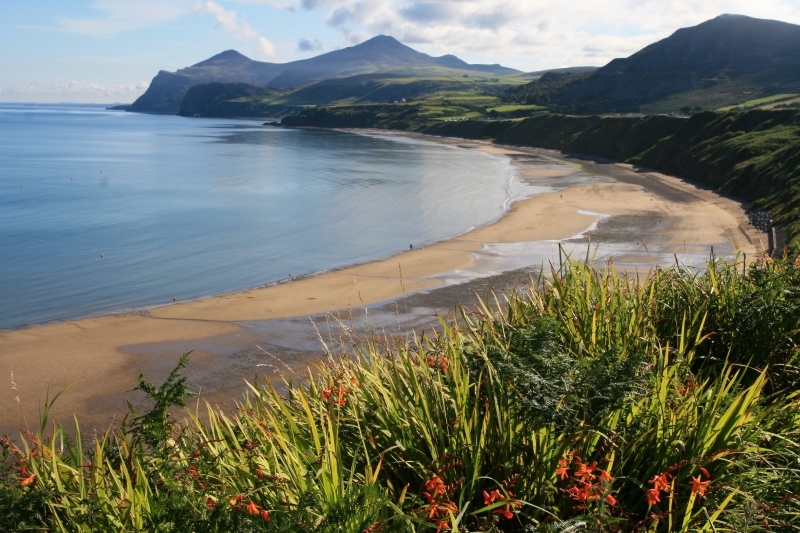 Porth Nefyn Beach is adjacent to the Llyn Peninsula Coastal Path and the Wales Coast Path. The tide at Porth Nefyn Beach is currently rising. High tide will be at approximately 9:33 PM, and the next low tide will be at approximately 4:15 AM tomorrow. Parking available in town or at the National trust car parks (there is a charge). around 9 miles east-southeast as the seagull flies, around 11 miles by road. around 13 miles east as the seagull flies, around 15 miles by road. around 6 miles southeast as the seagull flies, around 8 miles by road. around 6 miles south-southeast as the seagull flies, around 9 miles by road. around 5 miles west-southwest as the seagull flies, around 6 miles by road. just over a mile west as the seagull flies, around 2 miles by road. Visitor information for Porth Nefyn Beach, Gwynedd, Wales. Weather, tides, visitor comments, beach facilities, photos, nearest postcode, beach information and nearby accommodation.